Is Tony Ulwick from Strategyn the new guru of innovation ? Philip Kotler, another management guru, say yes : « I call him the Deming of innovation because, more than anyone else, Tony has turned innovation, into a science ». His book « Jobs To Be Done : from theory to practice » celebrates 25 years of Outcome-Based Innovation (ODI) success, basis of the Job-To-Be-Done Theory (JTBD) proposed by Clayton Christensen Harvard Business School Professor in Marketing. – This set me on a mission: I wanted to figure out a way to identify the metrics that customers use to judge the value of newly released products early on in the product planning process. – The results of that study showed that while the success rates of traditional innovation processes average 17 percent, the success rate of Outcome-Driven Innovation is 86 percent. Sorry, we know it is not correct : Functional Analysis helps exhaustive and formal needs expression since the ‘50s ! But we share the experience of Ulwick that this is still absent from most companies, and from many design methods ! Sure we can help fix this. – what a customer is trying to accomplish include (i) the core functional Job-to-be-Done, (ii) the desired outcomes tied to the core functional Job-to-be-Done, (iii) related jobs, (iv) emotional and social jobs, (v) consumption chain jobs, and (vi) the buyer’s financial desired outcomes. – Customers have needs related to buying, using, and owning a product. They have emotional and functional needs. Customer need statements are mutually exclusive—they are defined independent of each other. A complete set of needs is collectively exhaustive – it incorporates all the needs a customer has for a given job. Each need must be stated separately and categorized correctly. – One important factor that cannot be overlooked is that most markets are not homogeneous—meaning in nearly every market, customers do not agree on what needs are unmet. – The core functional job is the anchor around which all other needs are defined. It is defined first, then the emotional, related and consumption chain jobs are defined relative to the core functional job. – While defining the functional job correctly is important, uncovering the customer’s desired outcomes (the metrics they use to measure success when getting the job done) is the real key to success at innovation. – Jobs-to-be-Done Theory unlocks the mystery that has for decades been clouding the understanding of customer needs. – The product/service strategies introduced in this framework are defined as follows: Differentiated (Nespresso’s, Apple’s iPhone) /Dominant (Google AdWords, UberX, Netflix) / Disruptive (Google Docs, Coursera) / Discrete (drinks sold in airports) / Sustaining. – the Outcome-Based SegmentationTM methodology allow the same company to successfully run different strategies teignes on different segments. I. Define the Customer : : the end user (or functional job executor), the product life cycle support team (people who install, set up, store, transport, maintain, repair, clean, upgrade, and dispose of the product), and the purchase decision maker. II. Define the Jobs-to-be-Done : most products only get part of a job done … take the customer’s perspective … Define the job statement in the correct format: A job statement always begins with a verb and is followed by the object of the verb (a noun). We recognize here the VM way to express ‘functions’ = what the solution is doing to meet stakeholder needs. Sorry Ulwick does not know about ‘system modeling’ which secures and facilitates the solution function expression and relations to stakeholders needs ! III. Uncover Customer desired outcomes : create a “job map”, a visual depiction of the core functional job, deconstructed into its discrete process or job steps, independent of all the competing solutions that customers are using. Customers know perfectly well how they measure success when executing a job and are very capable of communicating those metrics—and those metrics, simply put, are their desired outcomes. A desired outcome statement includes a direction of improvement, a performance metric (usually time or likelihood), an object of control (the desired outcome), and a contextual clarifier (describing the context in which the outcome is desired). We recognize here the VM way to express ‘criteria’. Sorry Ulwick does not know about how to define and quantify them and allocate flexibility. IV. Find Segments of Opportunity. We recognize here the VM way to define solutions for each stakeholders segment. Sorry Ulwick does not go further, by defining the optimal solution for each separate need ! V. Define the Value Proposition. We recognize here the VM way to define a « what is enough » solution, which may be only a marketing message underlining what the product is used for ! VI. Conduct the Competitive Analysis. 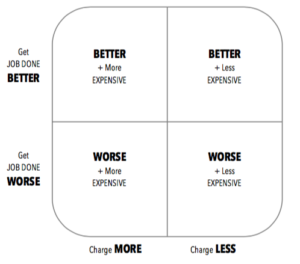 We recognize here the VM way to define a « what is enough » solution by comparing benchmarks against the JTBD instead one against the other. Sorry Ulwick does to go further to propose functional benchmarks : find solution answering the same need in other industries and sectors ! VIII. Target Hidden Growth Opportunities : an ‘opportunity algorithm’ is proposed, showing solution in a relative importance * satisfaction matrix. 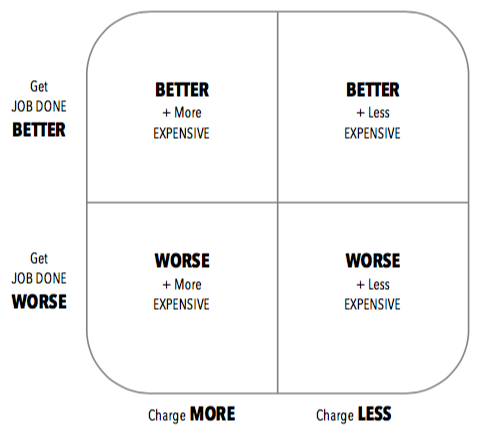 We recognize here the Value(s) matrix. Sorry Ulwick does not know about the 3D matrix showing also feasibility and costs. IX. Formulate the Market Strategy. We recognize here the VM Action Plan. X. Formulate the Product Strategy : Why reinvent the wheel? Innovation is the ability to use technology (existing or new) to address an unmet customer need. We recognize here the « What is enough? » question and the search for simpler solutions, quite often already existing in the company but ignored, or from an existing partner. – Nice case studies are presented : from Microsoft on Software Assurance, Kroll Ontrack on electronic document discovery solution for the legal industry, Arm & Hammer on refocusing animal nutrition products towards users needs, Bosch on entering the US circular saw market, About Medical Optics on gaining market shares by adding helpful devices to their products, Husmann on selling merchandising solutions instead of refrigerated boxes. 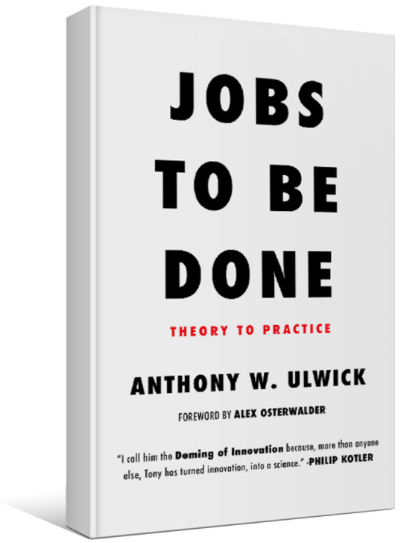 – Ulwick also presents the 84 steps on how to become an ODI professional in your company. Article précédent : A logo for Value(s) creation : what do you think ? Article suivant : « What is it for ? a system approach for value(s) creation » edited at last !